Independent Directions to this Site: From Highway 417 (The Queensway) take exit 138 (Eagleson/March Roads). If travelling west, the 0.6 km offramp sends you right or north onto March Road. If driving east, a 0.4 km offramp brings you to Eagleson Road, where you will turn left or north onto it and in 0.5 km join the westbound offramp traffic on March Road (it changed names as you went under the overpass). Both groups will now follow March Road northwest 8.0 km to Dunrobin Road. Turn right or north onto Dunrobin and go northwest 10.6 km to Vance's Side Road. Turn right or northeast onto Vance's and drive 1.8 km to park near the bridge at Constance Creek. Ottawa River West: Ontario Route Directions: From the Greenland area, when you have proceeded southeast on Greenland Road as far as Vance's Side Road, turn right or southwest onto it and go 1.2 km to park near the bridge over Constance Creek. Site Description and Birding Information: The marshes here are good for Virginia Rail, Sora, Marsh Wren, American Bittern, Green Heron and both Willow and Alder Flycatcher. The rare Least Bittern is found here too. Some of these birds will respond to imitations of their calls even during the day, but best results are had after dark. Whip-poor-wills can be heard calling beyond the fringes of the marsh at night. A Blue-gray Gnatcatcher was reported on July 3, 2005 from the wetland c. 200 metres west of the bridge. Ottawa River West: Ontario Route Directions: From Constance Creek at Vance's Side Road, proceed southeast 1.9 km to Dunrobin Road. 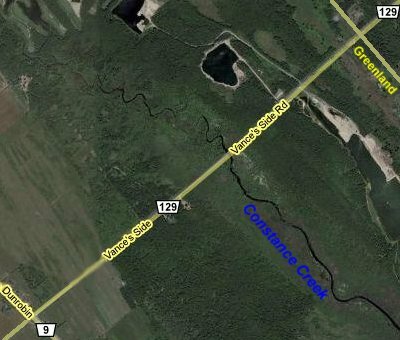 Turn right or northwest onto Dunrobin and go 5.0 km to the Constance Bay Road. Turn right or northeast onto it to begin the next route segment, Constance Bay. Return to Ottawa River West: Ontario. Return to Birding Ottawa Table of Contents.